The Intel® Desktop Board DG35EC Classic Series has been optimized to deliver new levels of performance and reliability for home and business users. 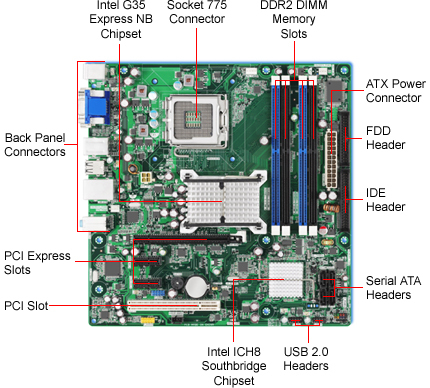 The Intel Desktop Board DG35EC has built-in microATX form factor supporting a range of processors including the Intel® Core™2 Duo processor, Intel® Core™2 Quad processor, Intel® Pentium® Dual-Core processor, Intel® Celeron® Dual-Core processor and Celeron® processor 400 series (up to 95W TDP). This board can support up to 8GB of dual channel DDR2 800/667 SDRAM memory. It also offers Intel® HD Video experience?, Intel® High Definition Audio with support for 5.1 surround sound, integrated 10/100/1000 Network connection and ample USB connectors for all your computer peripherals. This Intel desktop board also offers IEEE 1394a, a new feature that contributes to a great digital entertainment experience. The Intel Desktop Board DG35EC is Microsoft Windows Vista Premium ready. The Intel® 3 Series Chipset fully supports the visually stunning Microsoft Windows Aero* user interface with amazing transition effects and realistic animations. This motherboard features a Socket 775 design. The DG35EC motherboard is based on the Intel G35 Express Northbridge chipset and teh Intel ICH8 Southbridge chipset. It supports Intel Core 2 Quad, Core 2 Duo, Pentium Dual Core, Celeron Dual Core, and Celeron D 4xx Processors, with 800/1066/1333MHz Front Side Bus support. The DG35EC provides 4 DIMM sockets using Dual Channel 240-pin DDR2 with a total capacity of up to 8GB-64bit (4GB-32bit). You can install DDR2 667/800MHz Memory. 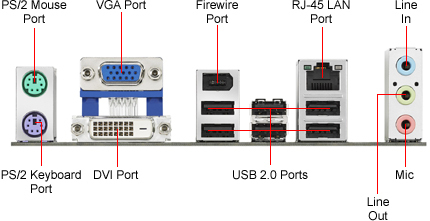 The DG35EC fully supports PCI Express, the latest I/O interconnect technology that speeds up the PCI bus. PCI Express features point-to-point serial interconnections between devices and allows higher clockspeeds by carrying data in packets. This high-speed interface is software compatible with existing PCI specifications. The DG35EC includes built in IDE facilities that support Ultra DMA 33 and ATA 66/100. The DG35EC comes with a Realtek ALC888S HD audio codec which supports high quality 6-channel audio. The DG35EC supports the Serial ATA technology through the Serial ATA interfaces. Doubles bus bandwidth which provides blazingly high disk performance, up to 3.0Gb/s.